Read nextIs this strange little car the start of a hydrogen revolution for the masses? This is pretty cool. CNN’s launching a dedicated Formula E show to go alongside its other premium sports shows, which cover golf, sailing, horse racing, equestrianism, skiing, Formula 1 and tennis. Presented by motor and tech broadcaster Nicki Shields, who also founded a tech startup, the show will feature highlights of the latest Formula E race but will venture beyond the circuit to focus on the cutting-edge sustainable technology powering the cars, how a new sport is being built from the ground up and the wider story of promoting cleaner practices in sport and the wider world. The series opener, aired on 13 February, and covered the Buenos Aires ePrix from Argentina and welcomed newcomers to the sport with an all-you-need–to–know briefing. 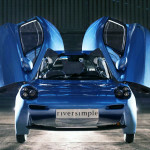 Is this strange little car the start of a hydrogen revolution for the masses?